Time for a new die cut challenge at Stuck On U Sketches!! and this week the challenge is TREE! I love these challenges. Each time I find myself discovering cuts that I have not noticed before. I got the Christmas solutions cart when I got my Gypsy, and I love the cuts on this one. I had not noticed the trees on this one till I searched for something else, but these were perfect for a winter scene for a christmas card, and they suited my Edwin stamp perfectly!! Edwin is painted with distress inks. If you have not seen my tutorial on how I do this, you will find it HERE. have not used much more embellishments on this card. The papers are from my scraps and are from Daisy D., the snowfalke/star die is from Marianne Design and the text stamp I do not remember where I got (it is one of my first stamps). Cute, cute, cute -- adorable image and trees! I love the papers you choose. Love your card and I can't believe we are so close to Christmas again! Oh I see your getting all your Christmas cards in order.. 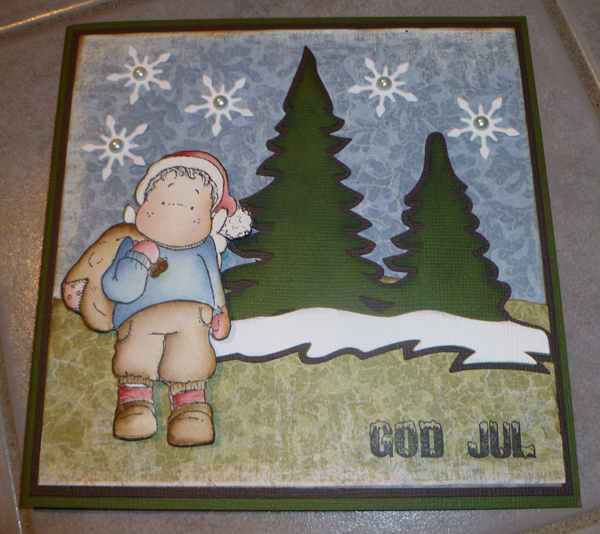 I absolutely love your take on our die cut challenge and you have such a way with your stamping.. brilliant!! The trees work perfectly for this project. Isn't great when you discover "new" cuts on old cartridges? Fabulous project! Love it to pieces! So glad you are on our team! What a great card Stine. I can't believe it's almost Christmas, can you! I'm going to have to check out your video, I'm starting to try differant stamping techniques, I still use the colored pencils and Mineral Spirits, lol! I really love this and love seeing your cards! I laugh at how popular these images are, they seem so much more over in Europe. And I don't have any! Geez! I'm so behind the times! LOL! And what you said about these challenges...I've found you are very right...its like rediscovering your carts all over again!!! Stine, I love your Christmas Card!! Your trees are perfect for the challenge and I love the Sweet Magnolia Stamp!! I also wanted to let you know that I got my package today and I'm absolutely thrilled!!!!!! I can use everything in it... And I'm overjoyed with the card you added! It's GORGEOUS!!! !I can't believe the layers on it!!! I will truly treasuer it! Thank you so much sweet friend!!! Have a wonderful week!! Hugs!! !